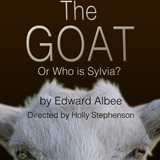 Three-time Pulitzer Prize winner Edward Albee's most provocative, daring, and controversial play since Who's Afraid of Virginia Woolf?, "The Goat…" won four major awards for best new play of the year (Tony, New York Drama Critics Circle, Drama Desk and Outer Critics Circle). In the play, Martin, a successful architect who has just turned 50, leads an ostensibly ideal life with his loving wife and gay teenage son. But when he confides to his best friend that he is also in love with a goat named Sylvia, he sets in motion events that will destroy his family and leave his life in tatters. The playwright himself describes it this way: Every civilization sets quite arbitrary limits to its tolerances. The play is about a family that is deeply rocked by an unimaginable event and they solve that problem. It is my hope that people will think afresh about whether or not all the values they hold are valid.